From a Revolution press release: With Texas heat on the rise, many find comfort being indoors. Last weekend marked record highs, but it didn't keep Revolution from stepping up to the challenge in preparation for the long tour ahead. 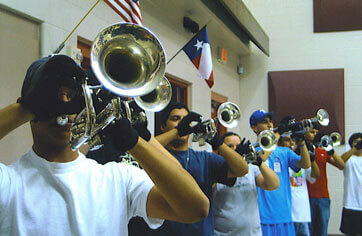 The successful camp was held at Canyon High School in New Braunfels, Texas. Many goals were accomplished with the help of the volunteer support staff, administration staff, instructors, members, and RevoBoosters. The brass and percussion were able to utilize the large stadium. They marched and played the opener, "Kaval Sviri." Guard learned opener drill and work routine. They were also able to march and perform the opener with the brass and percussion. The percussion worked hard all weekend to learn the drum feature. During show and tell on Sunday, they were able to showcase their talents to the parents present in the crowd. The brass also learned "Texas our Texas" for the Texas Drum Corps Preview event (on Saturday, June 24 in Austin, Texas).